Members of the book review panel, made up of STEM educators and literacy professionals appointed by NSTA, selected 24 books for the list from approximately 374 submissions. 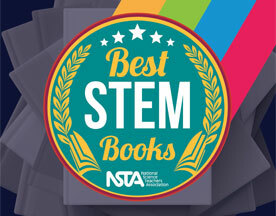 The panel based their decision on their extensive knowledge and looked for the very best STEM books that they believed would inspire K-12 students. The list of winning titles includes topics that range from the world’s most important innovations to using divergent thinking to explore outer space or the ocean.